Dodge Nitro News This section contains news related to the Dodge Nitro and Dodge Nitro SRT (concept) - It also contains site related news, so be sure to check this section often. Only Administrators may start topics in this section. Jeep Renegade vs Compass: Which Jeep is Right for You? To say the off-road brand from FCA is on a bit of a hot streak would be the understatement of this century. Last year, Jeep broke its own sales record, selling 973,227 vehicles in America during 2018. With even more new models on the horizon, it won’t be long before the brand finds itself in the exclusive seven-figure club, selling over a million units in a single calendar year. Occupying the entry-level end of the Jeep showroom are two machines whose missions are similar: draw customers to the brand using a combination of reasonable pricing and a city-friendly footprint. Add in a good dose of Jeep-signature styling and off-road cred and it is easy to see why the brand is red hot. 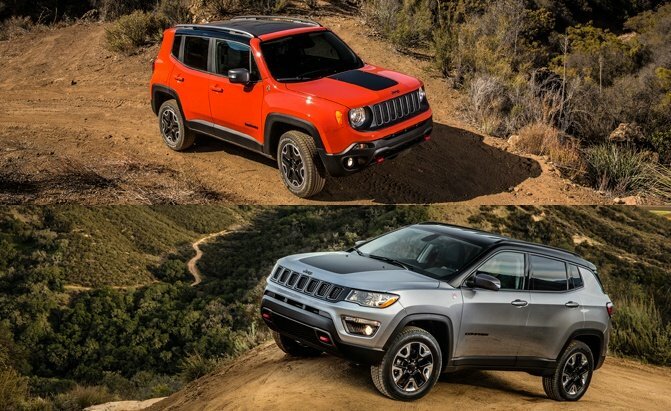 That identifiable “Jeepness” takes its form in two very different ways in the Renegade and Compass, affording these two models the luxury of appealing to completely different customer sets whose tastes and styles may not be similar. It’s a smart play, one that is rewarding Jeep with many cubic acres of cash. Which one is right for you? It’s our job to help you navigate the waters, so read on. Compass: Under the hood of all 2019 Jeep Compasses (Compi?) is the same 2.4L inline-four found in the smaller Renegade making an identical amount of power. Two-wheel drive versions of this trucklet can be fitted with a six-speed automatic or – joy of joys! – a six-speed manual transmission. Every model with power going to all four wheels earn a few extra cogs in its gearbox and are fitted with a nine-speed automatic. Properly equipped, the Compass is rated to tow 2,000 pounds. Bottom Line: Despite their size differences, similarly equipped Renegade and Compass models weigh roughly the same, meaning performance with the 2.4L engine should be comparable. Note that the turbocharged Renegade requires premium fuel, so consider that in your running cost calculations. Compass: The Trailhawk trim gets its own Active Drive Low 4×4 system, a unit which endows the rig with a full-time 4×4 mode. While it does not have a center diff, Trailhawk is capable of a 20:1 crawl ratio thanks to its unique 4×4 gear. Regular 4×2 and 4×4 Compass models have an approach angle of only about 16 degrees but selecting the Trailhawk trim increases that measure to an impressive 30.3 degrees. That’s Ford Raptor territory. Ground clearance is around eight inches on the Compass but the burly Trailhawk increases that to 8.5 inches, which allows for up to 19 inches of water fording. Some of that uptick can be partially attributed to the off-road-focused Falken Wildpeak tires with natty white lettering. Bottom Line: Most customers sign on the dotted line for a Jeep because they want some measure of off-road grunt … or at least the appearance of some. As proven by outright numbers, Trailhawk versions of both these rigs should be the choice of any customer who desires to stray from the beaten path. Despite being the most diminutive members of the Jeep family, both of these Trailhawk trims boast some impressive stats. Renegade: For 2019, new features have been added to the optional Advanced Tech Group package. It now includes adaptive cruise control and ParkSense parallel/perpendicular parking aids that’ll get you into the tightest of parking spots. An available 8.4-inch Uconnect system boasts Apple CarPlay, Android Auto, satellite radio, and crisp graphics. The available BeatsAudio premium sound system includes eight speakers and a subwoofer. Compass: Adaptive cruise control has been added to the Advanced Safety Group package, an optional group of kit that is available on higher-spec models. HID headlamps are available on some trims, ensuring drivers will light up previously unexplored areas of outer space. The company’s large 8.4-inch Uconnect touchscreen is available here as well, bringing the likes of Apple CarPlay and Android Auto to the party. Its interactive digital cluster residing between the speedometer and tachometer looks slick and is reminiscent of the unit found in more expensive Jeeps. Bottom Line: Both the Renegade and larger Compass are available with scads of technology ranging from digital goodies to stout off-road kit. The latter, showing up on Trailhawk models, sets these fraternal brothers apart in their respective competitive segments and allows them to compete on a plane many other small SUVs and crossovers cannot. Both crossovers are quite equally matched in terms of technology. 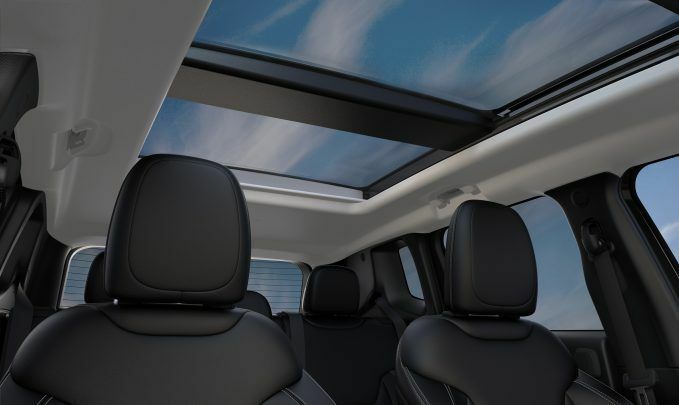 Renegade: With its boxy and upright styling, the Renegade boasts up to 41.1 inches of headroom for front seat occupants. This outstrips much larger 4×4 machinery such as the three-row Honda Pilot. Legroom is an equally impressive 41.2 inches up front but passengers relegated to the second row may want to be aware that only 35.1 inches of space is available in that part of the cabin. 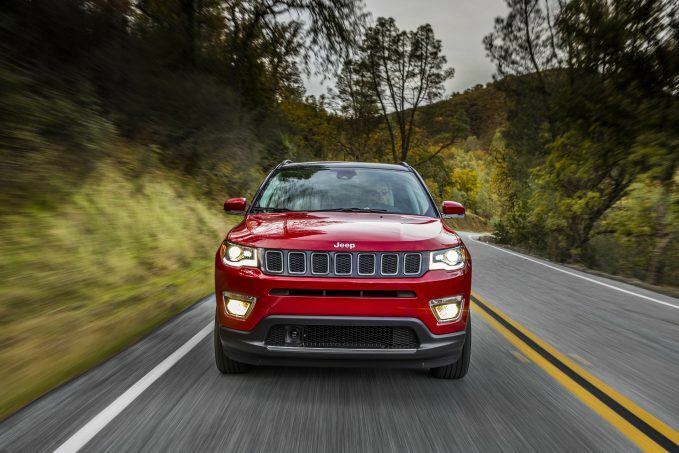 Compass: Given sleeker design language, the 2019 Jeep Compass gives up exactly two inches of headroom to its Renegade cousin. Models with a sunroof shave a bit more off that figure, leaving 38.6 inches of headroom up front. It is here the extra length of the Compass pays dividends, with both front and rear seat passengers enjoying more legroom than in the Renegade. The Compass is slightly wider inside as well, contributing to a roomier cabin. Bottom Line: It’s tough to argue with math, so it should be no surprises that the physically bigger Compass has more interior space for passengers in just about every measure, especially legroom. Shoppers who are planning to cart along family or friends on their off-road adventures should consider popping for the Compass and its larger dimensions. 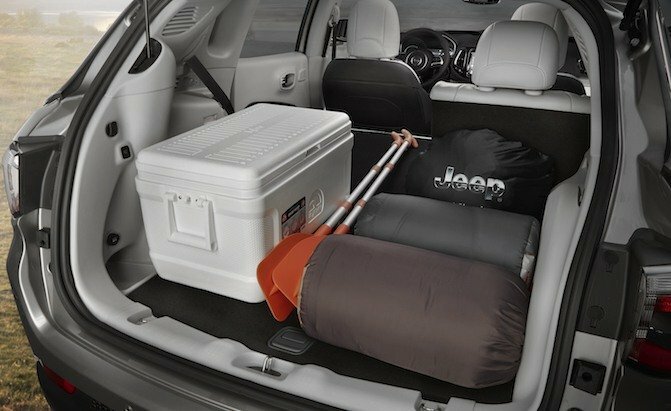 Renegade: With the rear seats up and hatchback closed, the Renegade can accept 18.5 cubic feet of life’s detritus. Folding those seats forward unlocks a total of 50.8 cubic feet of space. The Renegade’s boxy styling helps here but its length, just 166.6 inches, emphatically does not. Compass: Maximum cargo capacity with the rear bench seat deployed is 27.2 cubic feet. With that unit folded away, a total of 59.8 cubes of space is available in which to store the de rigeur lifestyle gear or, more likely, Costco purchases. Liftover height, as measured from terra firma to the liftgate scuff trim, is 31.1 inches. That means you’ll have to lift items a foot off the ground in order to store them in the back of your Compass. Bottom Line: No matter which way you slice it, the Compass is better at hauling stuff and things than the Renegade. It’s hard to argue with basic geometry, which teaches us that a long and wide space will have more volume than one which is shorter and narrower. Renegade: Barn-door aerodynamics conspire to give the Renegade a 0.36 Cd (coefficient of drag), which in turn scuppers some of the fuel economy gains realized by the Renegade’s efficient powertrain. Its fuel tank is rather small, accepting just 12.7 gallons. The front-wheel-drive Renegade with the 2.4L four-cylinder and 9-speed transmission is rated at 22 mpg city, 30 highway, and 25 combined. The AWD model gets a 1 mpg penalty with ratings of 21 city, 29 highway, and 24 combined. With the 1.4L turbo, the front-drive model with the six-speed manual is rated at 24 mpg city, 31 highway, and 26 combined. With AWD, that model curiously gets the same ratings. 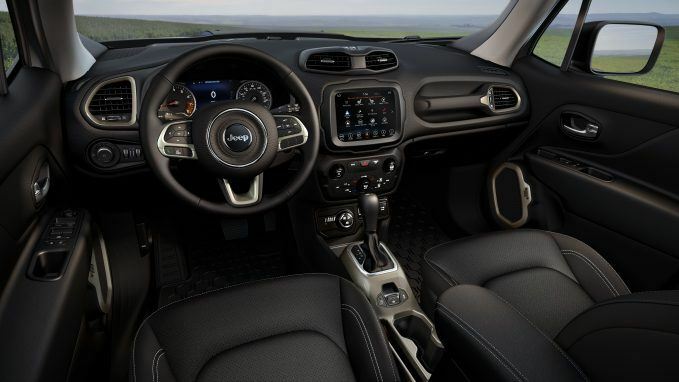 Compass: Manual transmission examples of the 2019 Jeep Compass are rated to return 23 mpg in the city and 32 mpg on the highway, at least in front-wheel drive models. Adding 4×4 draws a 1 mpg penalty from each measure. Opting for the automatic on a two-wheel drive Compass sets a fuel economy rating equal to a stickshift 4×4, while four-wheel drive rigs with an automatic transmission are rated to deliver 22 mpg in the city and 30 mpg in a highway environment. Bottom Line: It shouldn’t come as a surprise to most people that the larger vehicle endures a slightly lower fuel economy rating. Still, both vehicles are within but a hair’s breadth of each other in terms of how much fuel they consume so the real world difference will likely be marginal. Remember Jeep recommended the Renegade’s turbocharged engine be fed a diet of premium fuel with an octane of 91 or higher. Renegade: Jeep’s littlest trucklet has been given a wide-eyed set of peepers, not unlike those found on the venerable Wrangler. In fact, a seven-slat grille bookended by a pair of expressive round headlights is the look most people immediately think of when they hear the word ‘Jeep’. Other too-cute-by-half styling cues on the Renegade include taillights intended to resemble gasoline jerry cans and a small outline of the original Willys Jeep embossed into one corner of the windshield. It’s a funky shape that will be appreciated by some and reviled by others. Compass: The small Compass wears a natty set of duds meant to evoke the bigger – and much more expensive) Cherokee and Grand Cherokee. A narrow set of front peepers, wearing a dose of LED mascara in some trims, give the Compass a lighting signature very much in line with its bigger brothers. Family lineage is equally evident out back, where a pair of handsome taillights contribute to a cohesive and attractive style. Bottom Line: These two contestants offer styling that resides on both ends of the spectrum. The super-serious Compass would be a great selection for those who want the look of a more expensive machine without an eye-watering pricetag. Conversely, the Renegade is all fun, all the time. Will its goofiness grate on your nerves after a few months of ownership? That’s a question only you can answer. 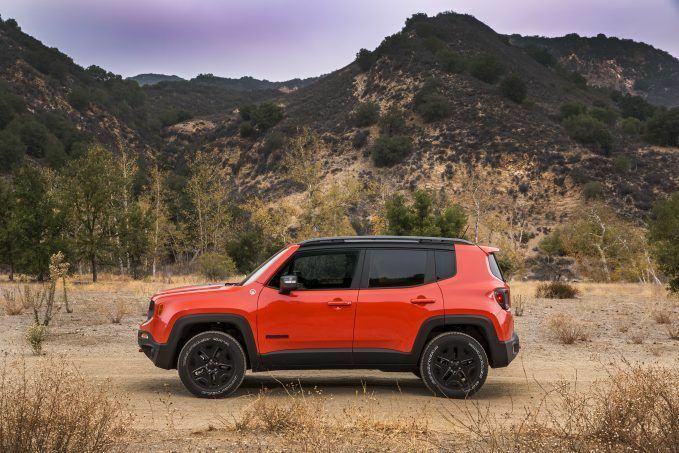 Renegade: According to Jeep, the 2019 Renegade sets an opening bid of $22,025 for a two-wheel drive Sport model. Upgrading to four-wheel drive will cost $1,500. The cheapest turbocharged model is priced at $26,395 (again, add $1,500 for 4×4) but, at that level, one can move over to the Trailhawk trim for $27,545. A new High Altitude variant, equipped with snazzy exterior and interior trappings, nudges it base price dangerously close to $30,000. Compass: Its assembly at the FCA plant in Toluca, Mexico, is sure to enrage some types, but the Compass enjoys solid fit and finish characteristics and a notable track record for reliability. Starting at $21,845 for a two-wheel drive Sport model with the manual transmission, Compass sets its sights on capturing buyers looking for an affordable rig with an off-road image. Popular trims such as the Latitude model are priced around $25,000 while the capable Trailhawk 4×4 starts at $29,195. Bottom Line: If you are thinking those prices are higher than they used to be, especially for the Renegade, you’re not wrong. There’s a reason why Jeep is the economic powerhouse at Fiat Chrysler. Judicious selection of option packages is a must, lest one inadvertently spend Trailhawk-level money on a less capable trim. Pricing here overlaps a lot. For all its expressive styling and neato upright stance, the Renegade gives up quite a bit to the Compass both in terms of livability and practicality. The Compass is the larger of these two Jeeps and has much more rear seat legroom and cargo space, meaning if those two items rank high on one’s priority list, attention must be given to the Compass. If you don’t need a lot of space, often drive by yourself or one other passenger, and want a funky style, then go for the Renegade.